Not dead yet. But the last weeks haven’t been very exciting in term of photographs. Time is flying and I am now for a few days in Switzerland, trying to reload my batteries and to clarify my future. Surrounded by new books (including the excellent “Infidel” by the late Tim Hetherington), I really feel like trying something different, another kind of pictures, less clean, less neat. More personal. 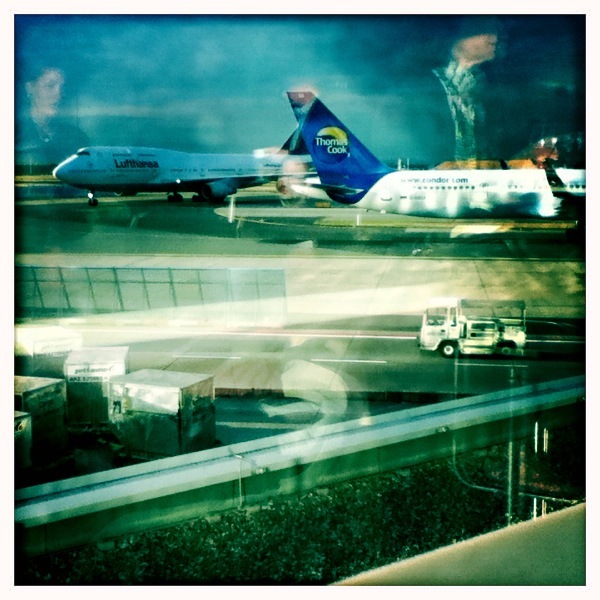 2 June 2011: Frankfurt airport, Germany. P.S: I still don’t understand why Apple didn’t put a better camera in their last iPod touch. One of the very few things that still fascinate me in flying is that dimension- and time-less world you enter after checking-in; a parallel universe, with airports being huge non-places of our modern society. We travel through and over so many places without really being there, completely oblivious of tragedies taking place under our feet. We cross paths with so many human beings coming from places we have never been to, and heading to places we will never visit. So amazing yet bewildering to sit down during a layover sipping coffee, feeling jet-lagged, listening to music, watching travelers go by, and being left wondering where everyone else needs to go. One can’t help feeling humble. Thanks for capturing (hopefully, intentionally) that surreal atmosphere with your shot.